Congratulations to all of our riders and trainers at Capital Challenge! 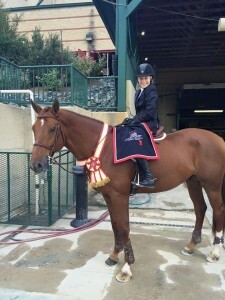 Elli Yeager was Reserve Champion of the Taylor Harris Insurance Services National Medal Finals. Madison Goetzman and our Contelido were Reserve Champion 13-14 Equitation (trainer Stacia Madden), and Emily MacLean and Cambridge were Reserve Champion 15 year old Equitation as well as top 20 in the North American Equitation Championships (co-trainer David Bustilos.) Last but not least our amazing trainer Tasha Visokay won the Winter’s Run Sportsmanship Award!! Great work team and good luck on the remainder of indoors!